Nene Valley Harriers secured an emphatic victory in Sunday’s East Anglian League fixture at the Embankment track. Peterborough AC finished as runners-up, and with Nene Valley winning six of the age groups and PAC the other two, it was a clean sweep for the Peterborough rivals. The Nene Valley athletes attained numerous individual victories and completely dominated the senior ladies age group winning virtually everything on the track. Georgie Ivens won both the 100 and 200m with times of 12.9 and 26.4 seconds while Alex Pullen and Kelsi Ellis were first in the B races. Megan Pussey and Claire Smith won the A and B 400m, and Emma Randall and Ellie Piccaver did the same over 1500m. Amber Park scored maximum points in the 1500m with a 5:05.8 clocking. Andrea Jenkins dominated the throws with firsts in the shot, discus and hammer. Newcomer Poppy Blake won the Under 13 high jump, and is the third generation of her family actively competing for Nene Valley with her mother Louise Blake a key member of the ladies road running team and grandad Ray Dowland a distance running stalwart. Club captain Dave Bush led from the front winning the shot and javelin along with the B shot. The Nene Valley youngsters dominated the sprints with Theo Briston achieving an Under 13 sprint double and William Kong doing likewise in the Under 15 age group. For Peterborough AC there was a winning treble for Ronnie Davey in the Under 13 boys age group. He took the A string high jump and 75m hurdles honours and also won the B string long jump. PAC also had a number of double winners. They were Amelia Fairclough (Under 13 200m and long jump), Elena Rivetti (Under 13 B 70m hurdles and B long jump), Elizabeth Taylor (Under 15 100m and 200m), Samantha Muchina (Under 15 100m B and 200m B), Georgia Price (senior ladies long jump and high jump B) and Ben Papworth (Under 17 400m and 200m B). Match result: 1 Nene Valley Harriers 954pts; 2 Peterborough AC 620pts; 3 Luton 490pts; 4 East Harling 425pts; 5 West Norfolk 324pts; 6 Leighton 323pts. Nene Valley’s men’s veterans track and field team stormed to the top of the Eastern Veterans League table at King’s Lynn on Wednesday. Finishing runners-up in the meeting behind host club Ryston Runners, Nene Valley had their sprinters and throwers to thank for a successful evening of athletics. Dave Brown won the Over 35 200m in 23.7 while Ricky Huskisson won the Over 50 race with a 27.7 clocking. Huskisson also won the high hurdles. Simon Achurch won the men’s javelin and discus with over 50 thrower John Blackwell and over 60 Tim Needham both scoring well in discus and javelin. 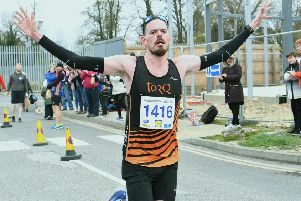 Long distance runner James Mcdonald won the 1.5k walk. Nene Valley ladies struggled due to a lack of numbers, but Claire Smith comfortably won the Over 35 200m in 28.4 and Andrea Jenkins took maximum points in the Over 35 discus and javelin. Nene Valley ladies finished fifth on the night out of seven teams and are also fifth in the overall standings. Peterborough AC ladies had a remarkable evening with a team of just two athletes finishing fourth, but within touching distance of second place. Judith Jagger won the Over 50 javelin and discus and also scored well in the jumps. Kay Gibson also took part in multiple events and added valuable points to the team’s total. Peterborough AC men finished sixth in a closely fought contest. Dave Whitehead ran 29.2 to win the Over 60 200m and Eamonn Dorling finished first in the Over 60 1500m.